Simon’s a tad taken aback. He has heard Jesus teach before and has been amazed. No one taught like Christ. But, with pardonable pride, Simon knows that not many fishermen fished as well as Simon. He knows fishing. It was worth stopping the endless work tending to his nets to listen to the Lord, but he’s tired and filled up with fishing. It’s time to go to the house, but . . .
Do you ever get your fill of experts? They’ve never coached a day in their life, but they know more than the coach. They’ve never doctored a day in their life, but they know more than the doctor. They’ve never taught a day in their life but they know more than the teacher. They’ve never farmed even a furrow but they know more than the farmer. They’ve not done the hard work or made the sacrifices or put in the hours to train or earned the experience only years can buy, but they know more about everybody else’s field than the folks in it. We all play the pseudo-expert at times. When we’re pompous about it, we can be insufferable; but even a little of such can a bit hard to take, especially when you’re bone tired, you’ve done your best, and the last thing you need is help from an expert. Jesus is certainly not being insufferable, and Simon is not even close to being deeply offended. But he’s really tired. And who’d blame him if behind his polite words is a little kernel of a “please mind your own business” rebuke? So out they go as Simon unlimbers his already stiff muscles. He takes the boat on out and then with a tired grunt he begins to toss out the nets. And . . . So many fish the nets begin to break! Simon suddenly realizes that the One who made the lake and the fish and . . . is in his boat! And Christ has caught not just a bunch of fish but also four apostles who through his power will “fish for men” and change the world. When Christ tells us to put out into the deep water, trust his promises, and follow him, something wonderful is always in store. 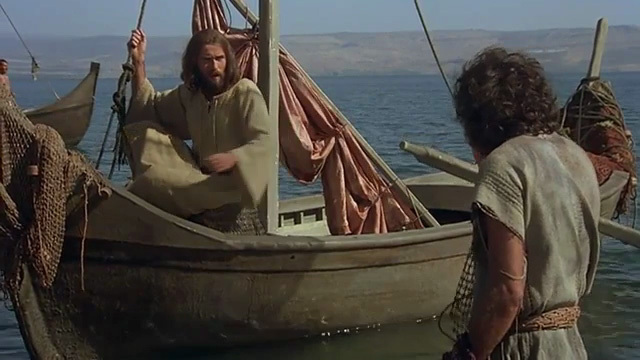 This entry was posted on Thursday, February 14th, 2019 at 8:49 pm	and tagged with calling of the disciples, Christ fishing, Faith, God's love, jesus, miracle catch, Peter, Peter's boat and posted in Uncategorized. You can follow any responses to this entry through the RSS 2.0 feed.